Anyone familiar with wildlife art recognizes the name of Owen Gromme. His paintings have established him as an icon of the American scene. His watercolor of three shovelers in flight was on the 1945-46 federal duck stamp. Gromme was honored as Ducks Unlimited's artist of the year in 1978. That same year the Wisconsin Department of Natural Resources commissioned Gromme to paint the design for the state's first duck stamp. And in 1983 the National Wildlife Art Collectors Society chose him as their artist of the year. Those accomplishments have awarded him a large audience. But neither the art world - nor the decoy collecting world - have been exposed to another facet of Gromme's artistic talents, his highly realistic interpretation of hunting decoys. Because Gromme only carved decoys for his own use, few collectors outside of Wisconsin have had the chance to handle one of them. But this is getting ahead of the story, for Gromme was more than a wildlife artist and decoy maker. This quiet and unassuming Midwesterner was actually one of the most dedicated champions of wildlife in the 20th century. Born in Fond du Lac, Wisconsin on July 5, 1896, Owen Justus Gromme grew up along the shores of Lake Winnebago. During his formative years he treasured the hours spent in the field with his father and other local outdoorsmen who hunted, fished and trapped in this region. They instilled in this young sportsman a profound interest in the ways of nature that would shape his entire life. His first boyhood attempt at taxidermy was practiced on an English sparrow that his mother had swept out the back door. Gromme never planned to be a professional artist; he never finished high school or had formal training in art. By his own admission he was more interested in hunting and fishing, yet he was a man of letters. During his lifetime Gromme kept a journal of his daily activities, which he referred to as his field notes since it invariably dealt with aspects of wildlife or related topics. The first entry is dated April 13, 1914; the initial chronicle eventually grew to well over 8000 pages. Within the many volumes are sketches and color notes of the specimens he collected, including the surrounding landscape, made to ensure he would accurately portray the details when he prepared his taxidermy mounts. After high school Gromme went to the Museum of Natural History in Chicago (now the Field Museum) where he worked as a taxidermist under Herbert L. Stoddard. Gromme recalled in a 1945 news article announcing his federal duck stamp prize that "they hired me because Herb Stoddard once saw me make a double on prairie chickens with a .410 shotgun. They needed someone in the field as a collector of specimens." Already a keen hunter and taxidermist, he developed into a superior wildlife artist. All of Gromme's experiences in Africa weren't tame. His favorite tale involved an enraged lioness charging him while he was filming unarmed. As the lioness leapt four feet above his head, his guide fired a fatal shot that blasted the beast midair, causing her to crumble, nose first to the ground, somersaulting and crashing at his feet. Gromme would say, "She was deader than hell, but I could still see the fire in that animal's eyes." As a self-taught artist, Gromme's training began in a somewhat mundane manner. In an interview with Jack Pearson, a writer with Exclusively Yours magazine, he explained, ""For a taxidermist, when mounting an animal or bird, color constitutes a continuous problem. The color of a bird's beak, for example, the eyes, any of the flesh areas, begins to fade quite rapidly after death." So his initial sketches were intended only for future reference, the opportunity to capture the vivid colors as accurately as possible. Although he had dabbled in oil painting earlier, his natural talents were now honed and directed to enhance his taxidermy work. Gromme soon began to paint seriously on canvas, developing a powerful style that goes beyond a mere portrayal of the subject, most commonly birds. Not only did he accurately illustrate it, but included its movements, its habits and habitats, its diet and nesting preferences, its enemies, and interaction with other life forms. Gromme recreated an entire environmental scene in which he claimed to "always leave the bird or animal a way to get out of the picture." He felt "a deep responsibility to show nature as it really is," and to that end he was determined to "study and restudy light and musculature and habitat so every one of my paintings will stand up to the scrutiny of knowledgeable people." In 1944 Gromme won the Federal duck stamp competition with a submission that would appear on the 1945 stamp. Yet his career as a wildlife artist would not begin in earnest until he retired from the Milwaukee Public Museum in 1965. The popularity of his paintings and prints allowed Gromme to fund many conservation projects with hundreds of thousands of dollars. He helped found and fund the International Crane Foundation in Baraboo, Wisconsin. The Wisconsin Citizens Natural Resources Association was able to fight the Federal government's management policies with proceeds from his Canada goose painting, "Requiem at Horicon Marsh." In 1961 he also appeared before the Secretary of the Interior, Stewart Udall, in Washington DC to question the management of the marsh. Many of his recommendations regarding regulation and management of all federal refuges were subsequently followed. 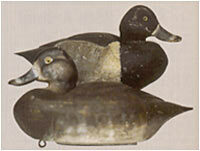 Gromme's decoys embody the distinctive realistic style that collectors refer to as the Milwaukee school of carving. He actually pioneered the design, and passed on the pattern to influence the decoys of fellow taxidermists Pelzer and Warren Dettmann as well as those by Earl Voelker. Gromme made mallard, pintail, bluebill, ringbill, canvasback and Canada goose decoys, carved in varying natural poses with fine details natural to each species. The bodies are deep and nicely rounded with a flat bottom. The primaries and wing tips are relief-carved and the heads and bills are recreated in exacting detail. Each is carefully painted with the precision of his trained eye. Some of Gromme's techniques may seem a trifle bizarre, but the results are hard to argue with. MacQuarrie's September 25, 1938 article in the Sunday Milwaukee Journal both described the process and rhapsodized over the results. "This is what Gromme did to make a wooden duck look like a live duck," he wrote. "He took a dead duck and stuck a rubber hose down its windpipe. He inflated said duck to its natural buoyancy, put it on the water, and took a picture of it with a camera right on a level with the water. From the small negative a life size print of the duck was made, to the inch. There was a silhouette of a duck on the water. It didn't look like most decoys." MacQuarrie continued with Gromme's techniques for nine more paragraphs and included drawn patterns and a large photograph of Gromme with nine decoys. After preparing life-sized sketches of a goose body - top and side views - with details of the head in the correct proportions, he made a wire form. Strips of burlap dipped in a thin solution of plaster were layered on this form to shape the goose. Thicker layers were then added, with Gromme continually shaping them, each time adding finer detail to the goose. When he had a desired model, a two-piece plaster mold was made, with each side mold having several sections to facilitate handling and removing casts. Gromme used the same model for all his goose bodies, but added different head styles - snuggle-head, sentinels and feeders. After painting a thin layer of oil to the inside of each section, heavy manila wrapping paper, softened with water then soaked in waterproof glue, was carefully pressed into the molds so no detailing would be lost. Several more layers were added, building the shell to at least an 1/8-inch thickness. At this point the two halves were tied together and allowed to dry for several days. When removed from the molds, the interiors were given a layer of asphalt paint and the exteriors were sealed with several coats of varnish. Probably the only decoy Gromme carved without the intent of hunting was a non-descript diving duck that was a reproduction of decoys his father made and Gromme hunted over as a kid. Willis Pennington, his friend and an early decoy collecting promoter, urged him to make it to show his support of the new decoy carving competitions and shows. Gromme was aware of the need to encourage new carvers to participate in the emerging competitions, and certainly this was part of the reason he never entered. "In order to make it less discouraging for the other fellows, perhaps decoy carvers who have won first prizes for one or two years be allowed to enter with a handicap, such as they do in shooting competitions...give the other carvers a chance" he suggested to Pennington. Perhaps the most ingenious piece that Gromme ever created was a one-of-a-kind goose call. He meticulously carved each anatomical feature of a Canada goose's head and bill, even including the interior nares (nostrils) and syrinx (voice box). The tongue protrudes, twisting to one side. Glass eyes are set in and they eyelids are carved around them. The head is screwed onto a sound chamber encased in wood panels. Unfortunately Gromme was the only person who understood the workings of the call. It is made of several pieces and no one dares to disassemble it. There appears to be a cloth bellows inside the sound chamber. There are two sections at the lower base of the goose head with an ivory triangle, which purpose no one can decipher. And so a mystery is embedded within this spectacular call, so beautifully carved and without compare. Another outstanding complex piece was his wing-flapping Canada goose field decoy. Now badly deteriorated, the papier-mache body covers an incredibly complex whittled wooden skeleton. Pulling on a string raised the hinged head, tilted the body upward, unfolded and flapped the wings in an anatomically correct manner, and returned the body to a standing position. The wings consisted of multiple pieces which each had nearly 30 real goose feathers attached to pivot with the wing movement to enhance realism. History may define Owen J. Gromme as a wildlife artist due to his commercial success in his later years. Now exposed to a larger audience, his hunting decoys may bring him additional respect. But it's no doubt that Gromme realized that both of these pursuits led to a greater and more important gain. That he dedicated both to further the conservation of natural resources made him a champion of wildlife. Thanks to Roy Gromme, Greg Septon/Milwaukee Public Museum, whose LORE magazine article on Gromme was an invaluable source, and to Tom Bosworth, who provided much additional information.